This modern layer has a cool, relaxed fit that elevates any outfit instantly. From pencil skirts to jeans, it basically works with everything in your closet. Talk about high ROI… Made in NYC. Final sale. Relaxed fit at shoulder and through the sleeve with an intentionally loose fit through body. Our model in black is 5’9.5” and wearing a size S. Our model in cobalt is 5’10.5” and wearing a size S. If you are in-between sizes, we recommend sizing down. 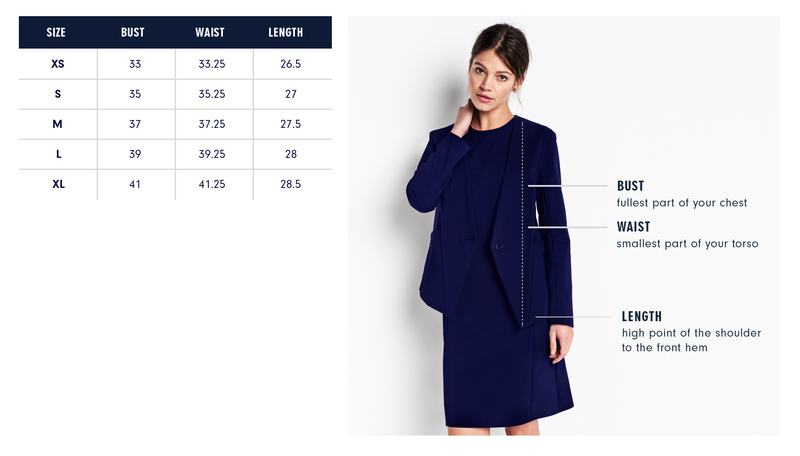 Below are the exact measurements of the Lenox Blazer. All measurements are in inches. For general brand fit, sizing, and measurements, please visit our Brand Fit & Size Guide. I wanted to make a slightly deconstructed blazer. I removed the shoulder pads and only lined the front panel to maintain the structure of the blazer but give it some ease and drape. This also makes it perfect for packing up in a suitcase! Features: Hem angled down towards front. No shoulder pads. Single button closure. Partially lined.